Members of the Ambassador Program are a select group of students committed to the positive promotion of our school. The Ambassadors provide information and hospitality to all Archbishop Carroll visitors and guests. Ambassadors help prospective students understand the benefits of attending Carroll. The ideal ambassador demonstrates leadership, pride and a desire to promote the mission of Carroll and the institution as a whole. Ambassadors give potential applicants a students’ view of academic, social, spiritual and co-curricular opportunities at Carroll. Student Ambassadors are expected to attend two or more non-shadow related campus events geared at attracting prospective families. Ambassadors receive training in communication, public relations, marketing as well as interpersonal skills. The administration selects the Augustine Scholars when they apply to Carroll in 8th grade, based on an interview, outstanding academic performance, and results of standardized testing. Augustine Scholars are exceptionally motivated to pursue intellectual inquiry and to achieve highly selective college admission. In addition to taking a demanding load of honors courses throughout their four years, students will participate in summer enrichment and college preparation opportunities. Augustine Scholars are required to participate in after-school meetings and fields trips; to maintain a GPA of 3.0 or higher; and to embody the values of St. Augustine, Archbishop Carroll’s patron saint, who found extraordinary intellectual achievement to be rewarding only when combined with a relationship with God and fellowship with other believers. The dance team performs together at Carroll’s performing arts events as well as during football and basketball games. Devoted to exploring a variety of dance styles, the dance team welcomes members with a strong work ethic and a range of dance experience. The debate team engages in Lincoln-Douglas debate, a style of debate in which participants anchor their points in values. A phenomenal way to develop logic, knowledge of different value structures, quick thinking and communication skills, debate is a fun way to meet students from other schools and grades. Archbishop Carroll’s debate team participates in annual tournaments at institutions such as Yale, Harvard and Princeton and competes in the Washington Arlington Catholic Forensics League (WACFL). Archbishop Carroll now offers three courses in Drama during the school day: Drama I: Introduction to Theatre, Drama II: Advanced Acting & Directing (Honors), and Drama III: Technical Theatre. Ms. Vicino, Carroll’s drama director, has extensive experience with the Washington area’s Imagination Stage, and our partners from Catholic University’s well-regarded music and theater programs also work with Carroll’s actors, singers and dancers. In addition to our course offerings during the day, there are many opportunities to get involved after school. The annual Christmas Show, a variety show that features the performing ensembles such as the Concert Choir and Wind Ensemble, also incorporates drama and dance. In the spring, Carroll students mount a full musical production. The Drama Club also hosts special events throughout the year such as trips to see performances at local theaters, collaboration with CUA Drama and the School of Music, and various workshops in acting and technical theatre. Young ladies in their sophomore year are selected to the group based on recommendations from teachers and school administrations. Established in January 2014, this group is led by a member of the guidance department. Group goals include mentoring and coaching young ladies to be leaders in the Carroll community. The young ladies are assisted with developing interpersonal skills by learning to accept feedback in addition to giving and receiving constructive criticism. Due to the success of the program, this year the group will be opened up to young ladies in all grade levels. A particular source of pride for our international students, the iClub celebrates the many cultures present within the Carroll community and available for our students to explore. The iClub welcomes students from all cultural backgrounds. The iClub hosts not-to-be-missed dinners, fields trips, and international travel to locations such as France and Costa Rica. The Lion's Den is a program that helps students achieve personal and academic success. Using a proactive approach, the program encourages students to advocate for themselves and to strengthen skills that will serve them well into the future, including the ability to take ownership of their education, make thoughtful decisions, problem-solve, and build positive relationships with adults and peers. Students are responsible for meeting with teachers, setting and monitoring academic plans, attending Lion’s Den group sessions twice a month, and meeting with guidance counselors. Begun through our collaboration with Catholic University’s law school, our mock trial program focuses on Constitutional law issues. Student participants role play witnesses or lawyers for both the prosecution and for the defense in the case assigned. They direct and cross-examine the appropriate witness, give opening and closing statements and try to win the case. Carroll’s team has competed against those from schools such as St. Anselm’s, DeMatha and Palotti. The judging is done by law professors and law students on the jury. The National Honor Society (NHS) is the nation's premier organization established to recognize outstanding high school students. More than just an honor roll, NHS serves to honor those students who have demonstrated excellence in the areas of scholarship, leadership, service, and character. These characteristics have been associated with membership in the organization since its beginning in 1921. Archbishop Carroll NHS members are the core of our Peer Tutoring Program. Peer Tutors are either current NHS members or students selected from teacher recommendations after an extensive application process. Program moderators match tutors with students according to the needs of the student and recommendations from teachers and guidance counselors. The goal of the program is for students to develop interpersonal skills through assisting their peers with identifying strategies to support learning and improve academic performance. Both tutors and those who seek tutoring become more confident, independent learners prepared to meet academic challenges. The Peer Ministers are a group of students selected based on teacher recommendations. Peer Ministers cultivate their own faith and that of fellow members of the Carroll community by running Archbishop Carroll’s liturgies and retreats. Peer Ministers take an additional religion course either during or after school. The Peer Mentoring Program is run by the Peer Ministers. The program teams junior and senior student peer ministers, who serve as positive role models for students who are in their first year at Carroll. The goal of the program is to assist students with their transition to high school or to a new school (for transfer students) and to strengthen and sustain students in meeting their educational goals. In addition, the program serves to help make the high school experience exciting and fulfilling. All wind ensemble instrumentalists and a marching drumline participate in the Pep Band, which performs at Archbishop Carroll pep rallies, all football games, and select basketball games. The Pep Band practices after-school on Wednesdays and Fridays and all students are welcome. Participation at a summer band camp is required. Student photographers chronicle life at Archbishop Carroll. Along with avid photographer and math teacher Mr. Courtemanche, Photography Club members take pictures at athletic contests, fine arts events, or ordinary, delightful days at Carroll and share those photographs with the yearbook and communications office. Students also explore together what constitutes a great photograph. Students learn new ping pong skills and enjoy a great form of recreation. Particularly vigorous participants can even earn physical education credit. Select student musicians can elect to perform in the orchestra for musicals. This is an audition only group that meets after school during 3rd quarter. In the Poetry Club, students explore their creativity and expression through writing. Club members enjoy watching and responding to fantastic videos, art and music, and play with language to create new, creative work. Students also participate in the all DC-MD-VA youth poetry slam, Louder Than a Bomb. 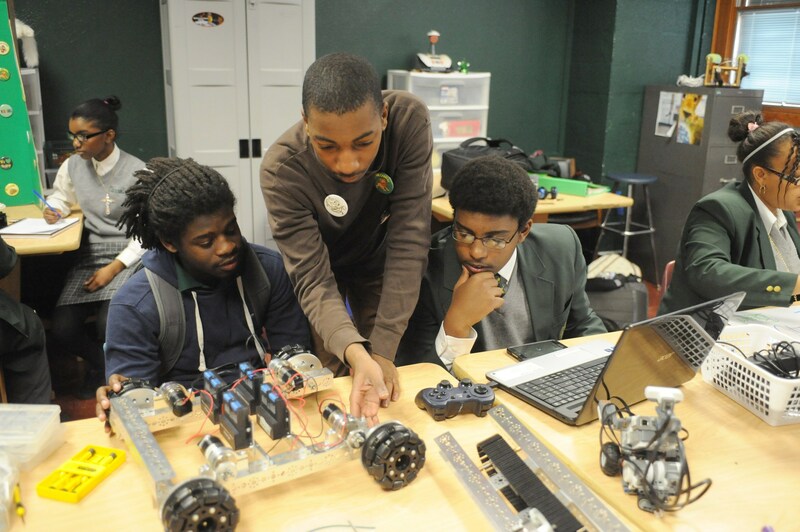 The Metal Lions build robots and compete both in FTC robotics challenges and in the Navy’s SeaPerch underwater robotics program. Winners of many awards in the last few years, the robotics team welcomes students from all grades and teaches engineering, programming, problem-solving, and teamwork while having a great time in competitions. The Spirit Squad brings Carroll love to our sports teams during their games. This group provides a unique opportunity for students to make a lot of noise for a great cause, and to lead the crowd in supporting Archbishop Carroll’s teams. The purpose of Carroll’s Student Government Association is to nurture a Catholic student community, through promoting student scholarship, school spirit and traditions. The Student Government Association serves to organize school activities, such as dances, spirit week, Homecoming, pep rallies, etc. The Student Council and class officers are representatives who are elected by their peers. Elections for all offices are held in the spring of the year prior to serving in office. The Virtues Committee is comprised of delegates from past and present Virtues Conventions as well as student appointees. The goal of the Virtues Committee is to allow students to take a leadership role in promoting the school’s virtues of Temperance, Charity and Faith, through school-wide activities and information and through frank solution-seeking around the challenges students and teachers face with demonstrating virtue. Students meet twice a month to brainstorm community initiatives that help to uplift the entire community and bring the Virtues Covenant to life.